Two sittings, 6:30 and 8:00 p.m.
Monday, January 28, is the 107th anniversary of Pollock’s birth, but we’ll be celebrating one day early at his favorite watering hole, The Springs Tavern, formerly Jungle Pete’s. Hosts Dan and Charlene DeSmet will lay on a special three-course menu taken from the pages of Robyn Lea’s book, Dinner with Jackson Pollock. Featured dishes include Cross-Country Johnny Cakes, whiskey-soaked chicken with collard greens, and brandied peaches. $40 prix fixe. The restaurant is located at 15 Fort Pond Boulevard, Springs, East Hampton. There will be two sittings, 6:30 and 8:00 p.m. Reservations required. This special celebration dinner is sure to sell out quickly, so make your reservations now! 631-527-7800. 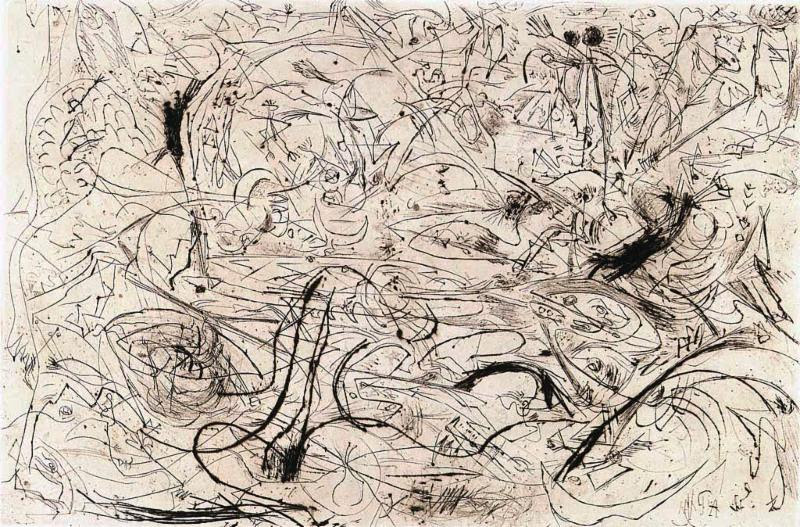 From January 17 – March 2, Washburn Gallery will highlight intaglio and silkscreen prints from two distinctive periods of Pollock’s career. The gallery is at 177 Tenth Avenue, between 20th and 21st Streets, in Manhattan. 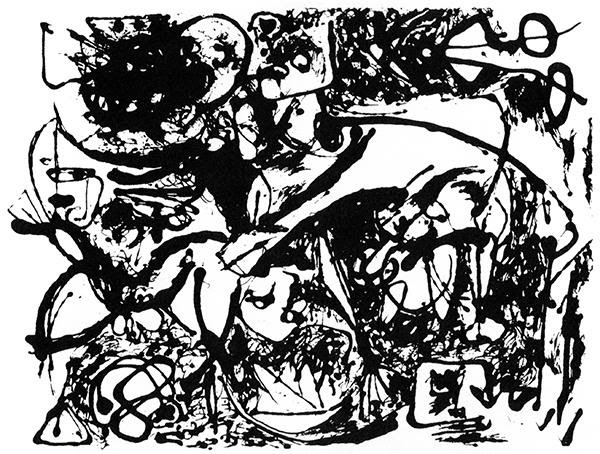 The intaglios, made at Atelier 17 in the fall and winter of 1944-45, illustrate his use of engraving and drypoint techniques to create abstract imagery that reflects the influence of Picasso, Miró, Masson and other members of the European avant-garde whom Pollock admired. He produced eleven intaglio images, but only pulled proofs and never made editions of them. After his death, Krasner authorized the printing of six of the plates in editions of 50. In 1951, Pollock and his brother Sanford McCoy produced a portfolio of six screenprints taken from photographs of his black enamel paintings completed that year. This was an early adaptation of photo-screenprinting for fine art use, years before Andy Warhol made the technique his trademark. The original edition was very small, but in 1964 Krasner authorized posthumous editions of 50 of each print, using the original screens and similar paper.